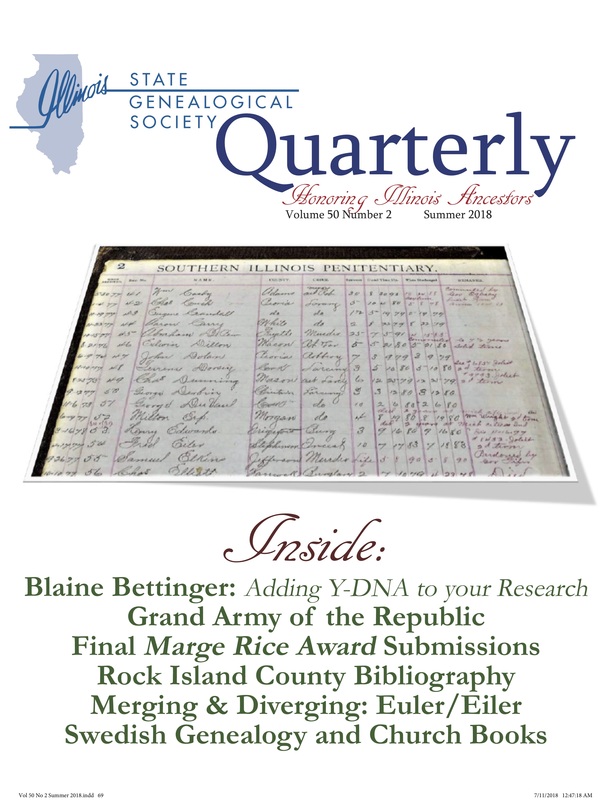 The Illinois State Genealogical Society Quarterly is read by over 1,000 members ( an exclusive benefit for "members only") and is held in many libraries throughout Illinois and the United States. The Quarterly is published four times a year and contains a variety of information relevant to family history research in Illinois. We accept original, unpublished submissions for inclusion in upcoming issues. If you would like to contribute to the Quarterly, please refer to our Author Guidelines for details (opens in PDF). Please direct all inquiries to the editor at isgsquarterly@ilgensoc.org. If you would like to become a member of ISGS, visit our Join ISGS! page. In addition to receiving a print copy of the Quarterly, members also enjoy reduced fees for ISGS conferences and workshops. If you are interested in advertising in the Quarterly, please contact the Advertising Committee at isgsadvertising@ilgensoc.org.